Rationale: The Venturi mask delivers the most accurate oxygen concentration. It is the best oxygen delivery system for the client with chronic airflow limitation such as chronic obstructive pulmonary disease, because it delivers a precise oxygen concentration. 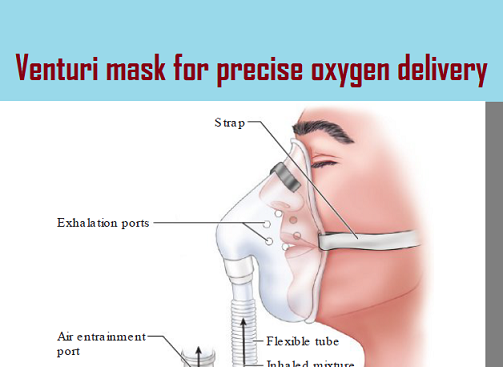 The face tent, aerosol mask, and tracheostomy collar are also high-flow oxygen delivery systems but most often are used to administer high humidity. Test-Taking Strategy: Focus on the subject, delivery of a precise oxygen concentration. Eliminate options 1, 3, and 4 because they are comparable or alike in that they are used to provide high humidity. Nasal cannula for low flow: Used for the client with chronic airflow limitation and for longterm oxygen use. Nasal high-flow(NHF) respiratorytherapy:Used for hypoxemic clients in mild to moderate respiratory distress. Simple face mask: Used for short-term oxygen therapy or to deliver oxygen in an emergency. 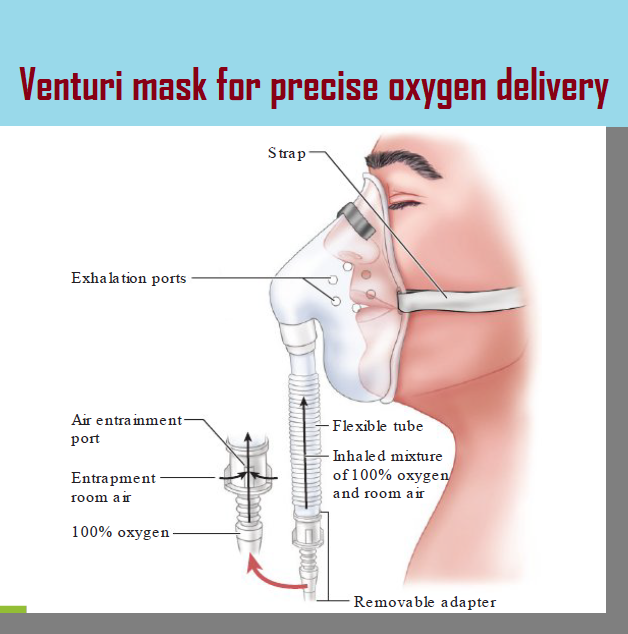 Venturi mask: Used for clients at risk for or experiencing acute respiratory failure. Nonrebreather mask: Most frequently used for the client with a deteriorating respiratory status who might require intubation. Tracheostomy collar and T-bar or T-piece:Tracheostomy collar is used to deliver high humidity and the desired oxygen to the client with a tracheostomy; the T-bar or T-piece is used to deliver the desired FiO2 to the client with a tracheostomy, laryngectomy, or endotracheal tube. Face tent: Used instead of a tight-fitting mask for the client who has facial trauma or burns.